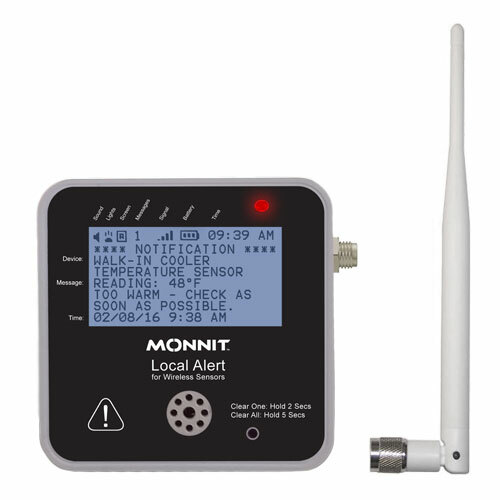 The Monnit Wireless Local Alert provides an additional way to receive critical notifications and sensor readings through your iMonnit network. Upon receiving a notification the Local Alert can flash an LED, sound an audible alarm, and display critical notification information. The Local Alert can also be used to display sensor readings from any sensor on the same account. When choosing to send a notification to the Local Alert, the user can choose what the device should do when it receives the notification. A notification can be programmed to flash the LED light, sound an audible alarm, display text on the LCD screen, or any combination of these features.